Ridicule and wit are sharper than knives in the right hands. It's supposed to be a statue of St Sergius of Radonezh. The peasant boy sporting a halo hovering in front of him is the boy Bartholomew, who grew up to become the saint. Weird juxtaposition. that is the worst one I have seen in this thread! Icon of Kate = beauty will save the world! But that ain't it. Somewhere in Holy Russia, Dostoyevsky is sobbing. Well I agree with that... certainly there was a failure of execution in this case... nonetheless, I have faith that some day such an icon will be produced! Shouldn't canonical icons of Duchess Kate have her dressed as the Queen of Hearts? Almost right, Shanghaiski. Number 3 is where you went wrong: national flags have no place in iconography. But I was mentioning their part in schlockonography. where did I write that they are icons? I assumed it was the boy Bartholomew and the mysterious hermit he met. And what about this? It depicts the nine celestial hierarchies. The middle ones in the top row look like some sort of insect. Of the nine orders of heavenly hosts, only the angels, archangels, seraphim and cherubim are given any sort of biblical description of their appearance, or have been revealed in a form visible to human eyes. There seems to be nothing revealed in Tradition which allows us to make an image of thrones, dominions, principalities, powers or virtues. The iconographer here has simply depicted these "unknown" ranks in the same way as angels and archangels. His depiction of seraphim, cherubim, angels and archangels is quite in order. Schlock? Not really. Just an honest, if not entirely correct, attempt. To my surprise, I cannot find an icon of this on the internet. Amateurish, childish, and not even funny. Gimme a break. A six year old child using a 15-year-old version of Paintshop Pro could have done it. Aren't the winged/ eyed wheels thrones? 15 Now as I looked at the living creatures, behold, a wheel was on the earth beside each living creature with its four faces. 16 The appearance of the wheels and their workings was like the color of beryl, and all four had the same likeness. The appearance of their workings was, as it were, a wheel in the middle of a wheel. 17 When they moved, they went toward any one of four directions; they did not turn aside when they went. 18 As for their rims, they were so high they were awesome; and their rims were full of eyes, all around the four of them. Ezekiel saw the ranks of Angels in varied form and in his opening proclaimed: Among them stand the six-winged Seraphim, and the many-eyed Cherubim circle round. With them he saw the Archangels shining like amber as they glorified Christ to all the ages. The cherubim are the "living creatures" with four faces, not the wheels. Hey, now that's not funny. Everyone knows I am the Devil, so how could I send myself? At least it is schlock! Read the above passage again. It clearly distinguishes between the "living creatures" and the wheels. Your position is not supported by the liturgical references, nor by the many icons in existence of "polyommata kherouvim", deicted as many-eyed winged red circles. What form, then, did the Cherubim on the Ark have? I always imagined they were sphynx-like shaped. Read the above passage again. It clearly distinguishes between the "living creatures" and the wheels. *Sigh* That's what I just said... And later on, in Chapter 10, Ezekiel identifies the "living creatures", not the wheels, as cherubim. 14 Each one had four faces: the first face was the face of a cherub, the second face the face of a man, the third the face of a lion, and the fourth the face of an eagle. 15 And the cherubim were lifted up. This was the living creature I saw by the River Chebar. 16 When the cherubim went, the wheels went beside them; and when the cherubim lifted their wings to mount up from the earth, the same wheels also did not turn from beside them. 17 When the cherubim stood still, the wheels stood still, and when one[c] was lifted up, the other[d] lifted itself up, for the spirit of the living creature was in them. 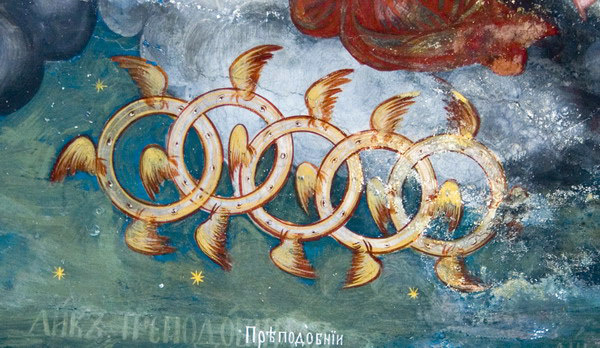 The cherubim are clearly distinct from the wheels, albeit closely connected. Note that the River Chebar is where Ezekiel has his vision in Chapter 1. What liturgical references? I have not seen any describing cherubim as winged wheels. 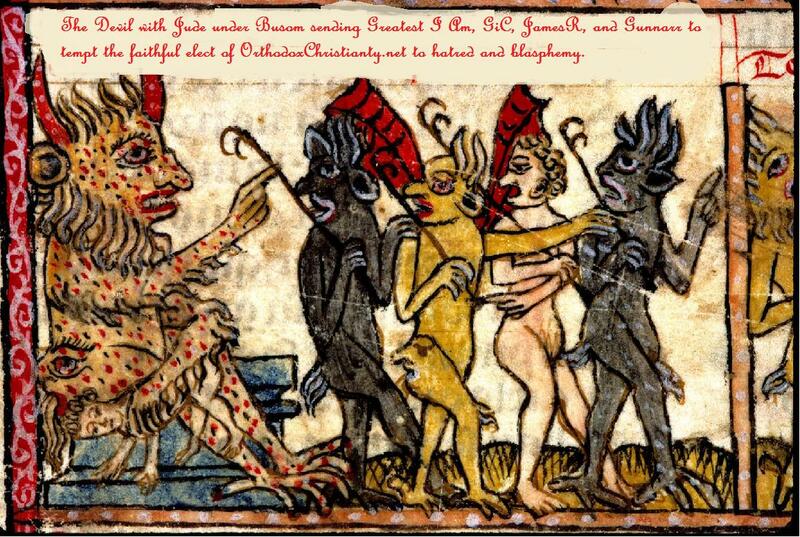 nor by the many icons in existence of "polyommata kherouvim", deicted as many-eyed winged red circles. What the heck are those? Wheels with wings? IMHO, angels are not wheels, at least most icons represent angels as humans, or at least faces with wings, as the seraphim on ripidas. I'm really glad that our iconographers have not ignored some of the weirder aspects of scripture. Actually, I'm pretty sure they're Thrones. Cherubim have flaming swords. I don't remember seeing eyed-wheels on icons of the Expulsion from Eden. Nor sphynx-like creatures either. Usually it's a "normal" angel or something that looks like a Seraphim. Frankly, I've got no idea why anyone would want that image enough to have it painted, but it is interesting. It would've been cooler, though, if the painter included the bursting open of his insides and the gushing out of his bowels. Good grief, that thing is creepy.